Ever's State of the State Address is great first step towards fulfilling public mandate to guarantee affordable health care in Wisconsin. STATEWIDE - In response to the first State of the State Address of Tony Evers, Citizen Action of Wisconsin members across the state applaud the Governor’s firm commitment to including BadgerCare expansion in the state budget. 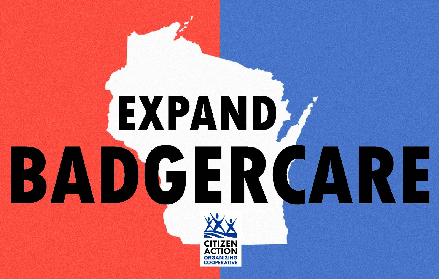 “Claiming hundreds of millions in federal tax dollars already set aside for Wisconsin to expand BadgerCare to more low income families is a great first step in fulfilling the election mandate to guarantee affordable quality health care,” said Robert Kraig, Executive Director of Citizen Action of Wisconsin. Claiming the federal Medicaid dollars earmarked for Wisconsin would expand BadgerCare access to at least 75,000 Wisconsinites, most of whom work in home care, food services, cleaning services, child care, landscaping, and similar jobs that don’t offer insurance. 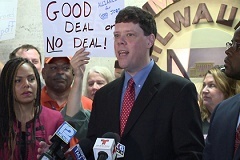 Highly partisan decisions made by former Governor Walker and the conservative majority in the Legislature needlessly took health coverage away from tens of thousands of Wisconsinites. Wisconsin is now one of only 14 states, mostly in the deep south, who are refusing to claim the additional federal dollars to expand health care for low income residents who can’t get affordable health insurance at work. BadgerCare is Wisconsin’s homegrown health insurance program for low-income children and adults to help them get and stay healthy. It allows them to see a doctor when they are sick, get check-ups, buy medications, and go to the hospital without fear of choosing between their health and groceries or paying the rent. BadgerCare expansion will increase health care access to workers who do not earn enough to pay for health insurance or aren't offered health insurance through their jobs. BadgerCare expansion will fill the gap for people who fall on hard times and ensure they have access to health care as they recover from an illness. BadgerCare expansion will help people who need temporary support because they lose a job or become too sick to work. BadgerCare expansion will help people who have to take off work to care for an ailing parent or a sick child. BadgerCare expansion will help people in rural areas who don’t have employers who provide health coverage, like family farmers and agricultural workers, when they have a bad crop or commodity prices plummet unexpectedly. BadgerCare expansion will offer financial protection for working families so that they do not have to go bankrupt when they face an unexpected illness or need to go to the hospital. BadgerCare expansion will help people who lose their jobs due to cancer and other serious illnesses, assuring that they don’t lose access to health care when the need it most. BadgerCare expansion protects Wisconsinites when the unexpected happens and drains the budget, like having a child with special needs like autism. BadgerCare expansion is especially important in the modern economy, where more and more jobs lack health coverage. Jobs are different today—they’re not all 9-to-5 at big companies with good benefits. Many Americans are struggling to make ends meet with multiple part time or seasonal jobs. At the same time, health care, child care, and housing costs are going through the roof. Health insurance costs more than ever and Medicaid fills the gap so the most vulnerable Americans get the care they need.